Don’t miss our next Shred-A-Thon on April 21, 2018. Thank-you to everyone who participated in our Shred-A-Thon. What a great turn out! We collected $617.00 which will be used to purchase Thanksgiving turkeys for Kyrene families in need. A record 20,640 pounds of shredded paper – keeping identities safe! The 20,640 pounds of paper has a value of $1032. This money goes to the Tempe Centers of Habilitation. Over 200 cars/trucks brought paper for the Shred-A-Thon. A Special Thank- you to ASDD Document Destruction for your trucks and amazing employees who worked tirelessly at the Shred-A-Thon. And a big thank-you to all the volunteers who help! Plan to stop by our next Shred-A-Thon April 21, 2018. This will again be held at Monte Vista Elementary School from 9 AM – 11 AM. It is time again for our FREE Shred-A-Thon October 21, 2017 at Monte Vista elementary school in Ahwatukee. Join Shirley Coomer and Gregory Stainton of Keller Williams Realty Sonoran Living for their semi-annual Shred-A-Thon. 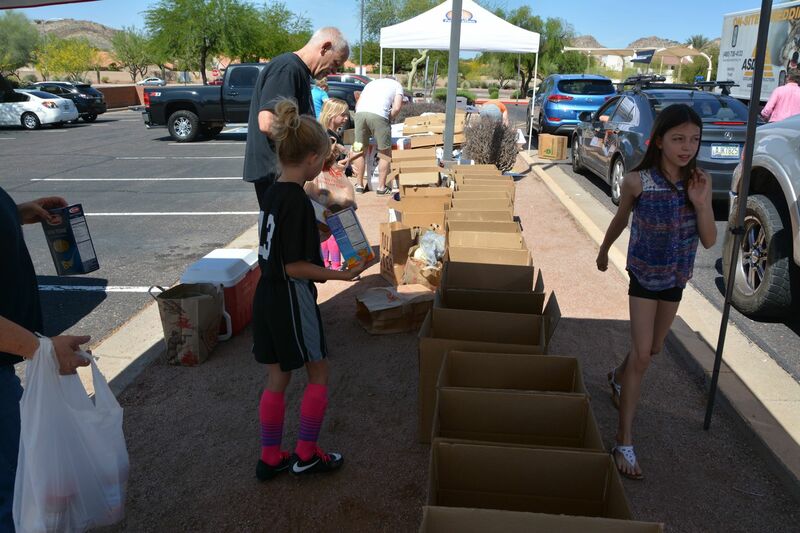 Shirley Coomer and Gregory Stainton of Keller Williams Realty Sonoran Living for their semi-annual Shred-A-Thon. This Shred-A-Thon is provided as a community service. This event was established to prevent identity theft by providing a twice a year shredding opportunity. Consequently, this is a convenient way for local residents to shred unneeded documents at a convenient location. 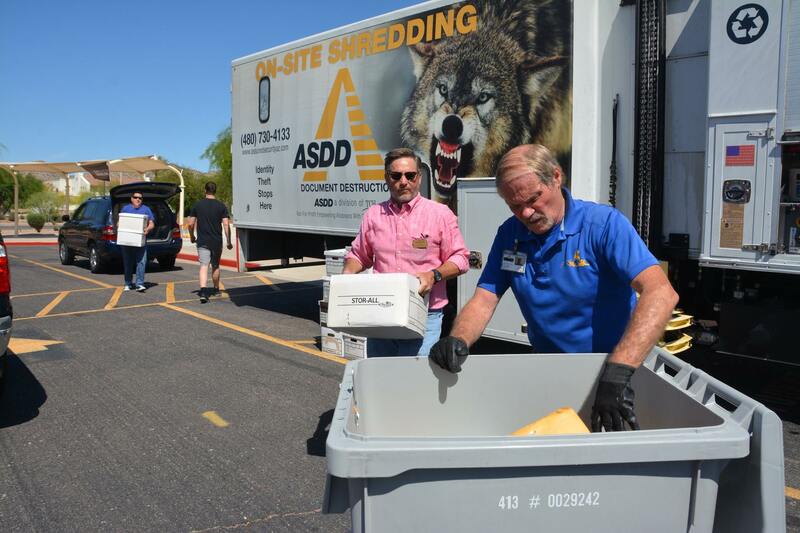 The Shredding service is donated by ASDD Document Destruction of Tempe. The shredded documents are sold to benefit the Tempe Hilibation Center. There will be a shred truck on site for those who want to see their documents shredded. There will also be a truck with secure bins that are locked. The contents transported to the ASDD facility in Tempe for their commercial shredding. So don’t miss the Free Shred-A-Thon October 21, 2017, at Monte Vista. Shirley & Gregory ask for a food donation for the Kyrene Food Bank. This is located at the Kyrene Resource Center supported by the Kyrene Foundation. Suggest donation is one food item for each box or bag of shred items brought to the Shred-A-Thon. No need to remove staples or paper clips (no 3 ring binders). ASDD can also accommodate the shredding of CDs. While we can not accept hardware for shredding. However, ASDD’s Tempe facility can accommodate shredding of hard drives. The Kyrene Family Resource Center provides food for Kyrene Families. Also, this center is also a resource for families of Kyrene students in need of clothes, hygiene items, etc. In October, we are again collecting Thanksgiving Foor for the Thanksgiving Food Boxes that will be given out by the Kyrene Foundation to Kyrene families in need. So don’t miss the Free Shred-A-Thon October 21, 2017, at Monte Vista elementary school in Ahwatukee. Don’t miss this FREE Shred-A-Thon October 21, 2017, at Kyrene Monte Vista elementary school and keep your identity safe! 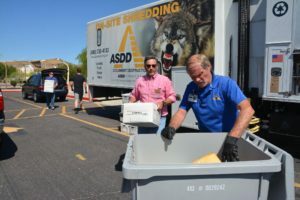 This Shred-A-Thon is sponsored by Shirley Coomer and Gregory Stainton each April and October to give back to the Ahwatukee community. As Ahwatukee residents, Both Shirley and Gregory’s children attended the highly rated Kyrene schools. And, both are on the board of directors for the Kyrene Foundation which supports the Kyrene Family Resource Center. They are passionate about supporting the Foundation through many fundraising events. As local Realtors with Keller Williams Realty, they know first hand how identity theft can affect home buyers when they apply for home loans. Those attending the Shred-A-Thon can donate non-perishable food, which is critical to helping the Kyrene Resource Center meet the needs of many of the Kyrene District’s families in need of food assistance. Kyrene Family Resource Center, supported by the Kyrene Foundation is located at Kyrene de los Ninos Elementary school located at 1330 E Dava Dr, Tempe Az 85283. The Kyrene Family Resource Center is open to any family that has a student enrolled in the Kyrene School District. Their mission is “removing barriers to learning” and the resources provided support that mission. The staff at the Kyrene Family Resource Center are available to meet with families in need of assistance, and no appointments are needed during open hours. This is a free, semi-annual community event to provide on-site document shredding at Kyrene Monte Vista Elementary school. Attendees are asked to donate a nonperishable food item for each box or bag brought. The food collected goes to the Kyrene Family Resource Center which supports families of students in the Kyrene School District.